To do these projects, you need to use the Google Chrome browser. If you don't have it, go to http://www.google.com/chrome to download and install it. This brings you to the "Web Application Exploits and Defenses" page. Scroll to the bottom of this page, and click Continue. This brings you to the "Web Application Exploits and Defenses (Part 1)" page. Read the "Setup" section. Open your own instance of Gruyere in a second browser window. At the bottom of this page, read the "Using Gruyere" section. Perform the tasks listed there. This brings you to the "Web Application Exploits and Defenses (Part 2)" page. Scroll to the bottom of this page, and click Continue. This brings you to the "Web Application Exploits and Defenses (Part 2)" page. Scroll to the bottom of this page, and click Continue. This brings you to the "Web Application Exploits and Defenses (Part 3)" page. The Gruyere Profile page opens, as shown below. Notice the URL: it ends in the filename editprofile.gtl. Scroll to the bottom of the page and click the Update button. This returns you to the home page. But how did Gruyere collect the data from the Profile form and send it to the Web server? To see that, in your Gruyere window, on the upper right, click "Profile" again. A pane opens at the bottom of the browser showing the Developer Tools. In the "Developer Tools" pane, click the Network tab. 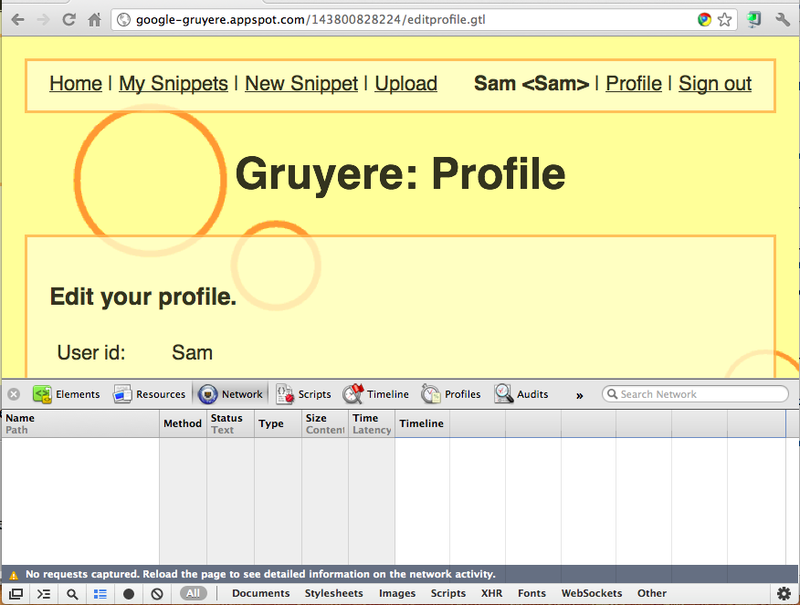 In the upper pane, showing the Gruyere Profile page, scroll to the bottom. Click the Update button. 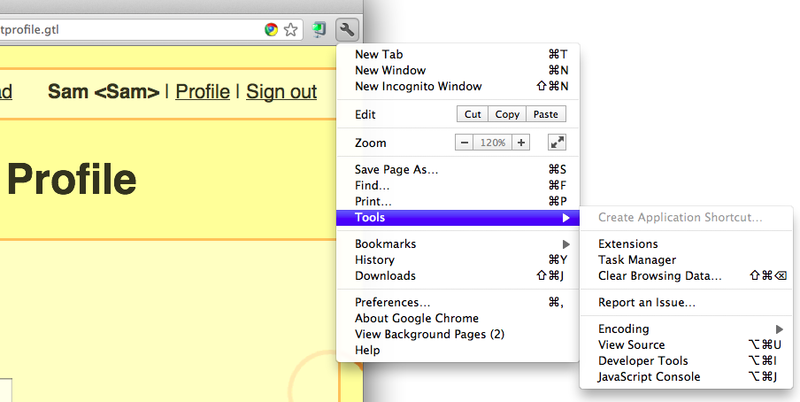 In the "Developer Tools" pane, scroll to the first line, which starts with the name saveprofile. Hover the mouse over the name saveprofile. As you can see, Gruyere sends all the data up in the URL, such as your name. You don't need to use the form! Type the URL below into the Chrome URL bar, replacing the number with your own Gruyere instance number, and replacing YOURNAME with your own name. Do not include any spaces in your name. Press Enter to go to that URL. Gruyere administrator profiles are identified by a parameter named "is_admin". There's no obvious way to know that from what you have seen so far, but it can be found by examining the source code of the editprofile.gtl script. In any case, this is the vulnerability we will exploit. 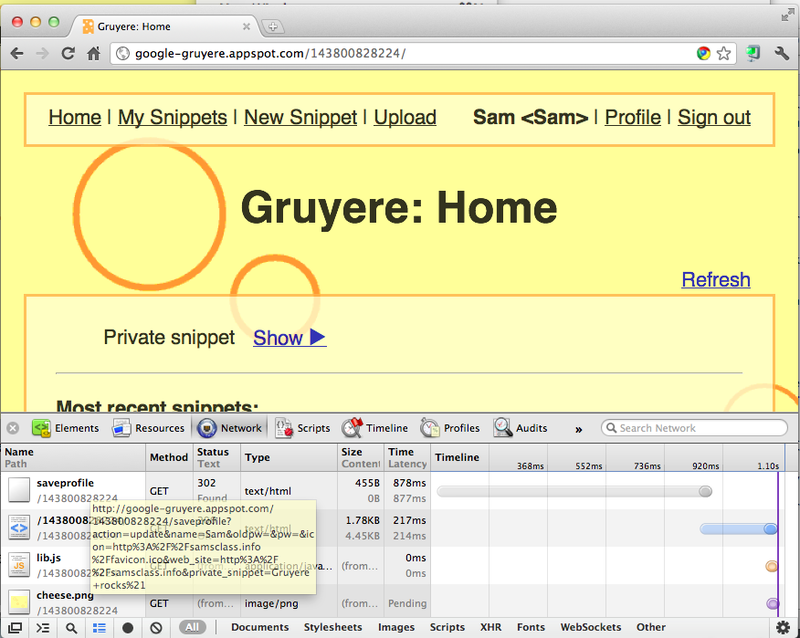 Type the URL below into the Chrome URL bar, replacing the number with your own Gruyere instance number. After visiting this URL, your account is now marked as an administrator but your cookie still says you're not. So sign out and back in to get a new cookie. After logging in, notice the "Manage this server" link on the top right, as shown below. This shows that you have elevated yourself to Administrator! Make sure the "Manage this server" link appears in the upper right of the Gruyere window, as shown above. Save an image with the name "Project 3x from YOUR NAME"
Email the image to cnit.120@gmail.com with a subject of "Project 3x from YOUR NAME".